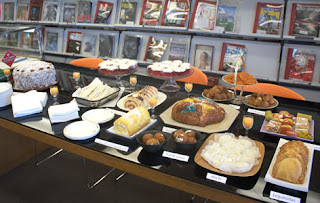 A World of Cake has just been named Best international baking book by Publisher's Weekly! In their Best Cookbooks of 2010 article they raved, "A World of Cake: 150 Recipes for Sweet Traditions by Krystina Castella (Storey). Pictures of marzipan-covered fruitcakes are gorgeous, and sidebars on such topics as street cakes make this an educational book in addition to a holiday workhorse." Krystina Castella, author of A World of Cake, has been out and about, promoting this new release by Storey Publishing along with her other two books. 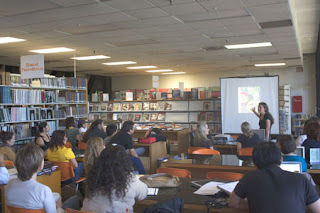 She sent us photos of a recent event/lecture that she gave to students at the Art Center College of Design. 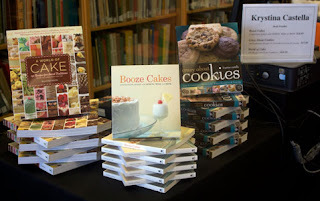 Krystina spoke to the students about the inspiration for her book A World of Cake, as well as about the history of cakes, the process of putting the book together, and how to get a book published. The college bookstore carried the three books written by Krystina, and they were sold out before the lecture was through and had to take special orders. 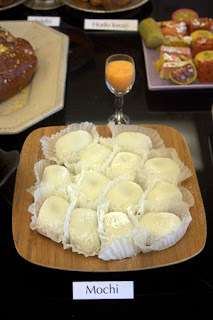 The students enjoyed this week’s holiday cakes — pan de muerto for Day of the Dead and gulab jamun and jalebis for Diwali. Also there was mochi, guava Swiss roll, hodo kwaja, red velvet cupcakes, German chocolate cake, corn cake, and empanadas. 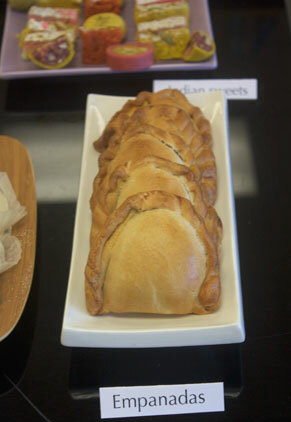 Empanadas: Popular throughout Latin America, these empanadas are filled with quince, mango, and pineapple. Mochi: Traditionally tied to the Japanese tea ceremony, it is now a popular New Year’s cake. Learn more about the history of cakes throughout the world, get the recipes, and maybe surprise your family this holiday season with a cake your ancestors made! 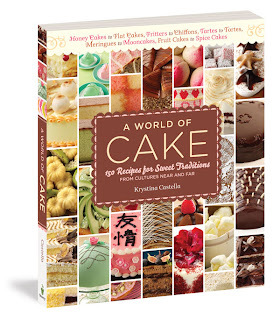 All of this and more can be found in Krystina Castella's A World of Cake. See the book trailer on YouTube. I love makiing cake but I am terrible at frosting them! I always seem to tear up the top and end up with cake pieces in the frosting! I'd love to be able to look through this cookbook. It sounds fascinating! The event sounds like it was a lot of fun. I also love the title of Booze Cakes. Who could resist that? You can email me at lynncraig AT comcast DOT net for a snailmail address. This is such a beautiful and informative cookbook. It's full of mouth-watering photographs, and the history of each cake is quite interesting. Probably my favorite part of the book is the section on Cake Holidays, which is a month-by-month calendar of cakes made specially for world holidays. For instance, July 1 is Canada Day, and the correlating cakes (with recipes) are a Canadian maple-walnut tourlouche and a Canadian Nanaimo Bar. Highly Recommended!